"I don't know, it sort of seems like someone playacting at having radical freedom..."
WRONG, no! That joke gets funnier every time. 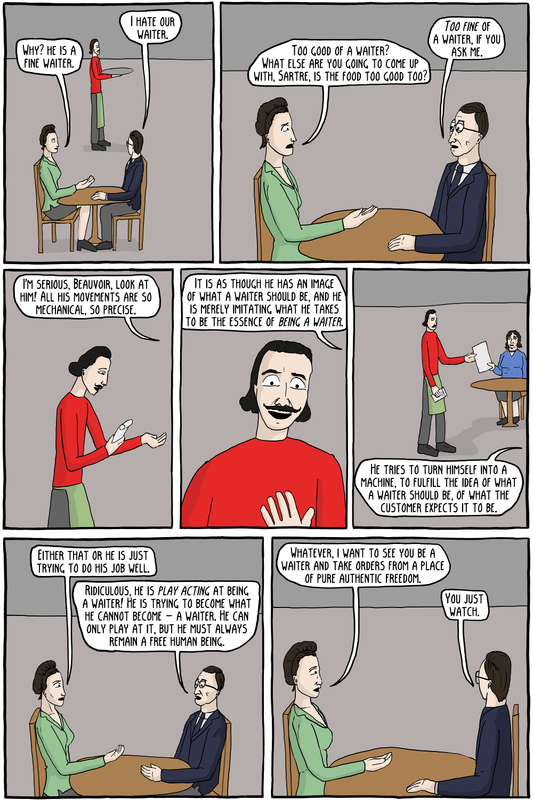 The joke is based on Sartre's account of Bad Faith in Being and Nothingness, where he describes a waiter who is "play acting" at being a waiter. He says that we can imagine a waiter who a bit too stiff and mechanical, because he is trying to imitate a waiter. This apparently means that the waiter is just "play acting", because can't fully become a waiter (even though he tries), since a waiter is just a sort of social function (taking orders, acting a certain way, etc). 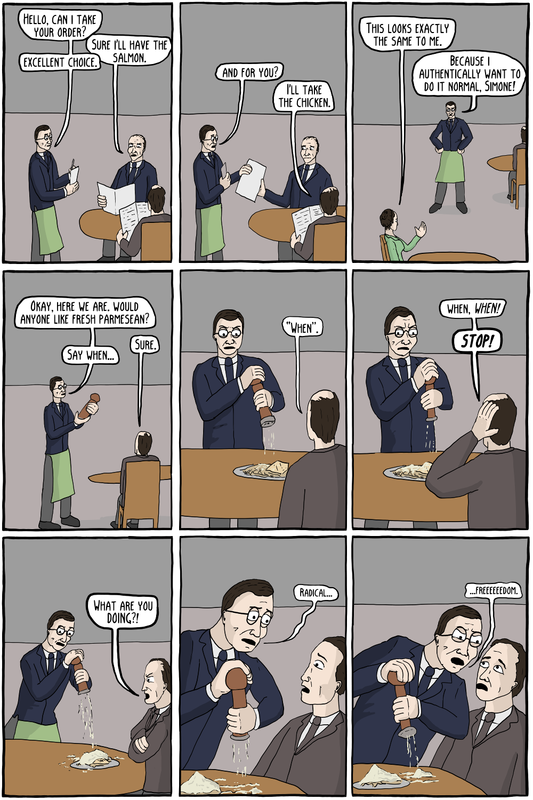 Thus, for Sartre, the waiter is denying his freedom, by trying to become a sort of machine (and failing). This puts the waiter in "bad faith". It is really one of the worst examples in the history of philosophy (sometimes reading Being and Nothingness you sort of get the feeling that Sartre was playacting at being a philosopher). In philosophy, there are generally two ways to write: so that it is easy for you to be understood, or so that it is difficult for you to be misunderstood. Sartre was doing the former by using a familiar example, but there are so many ways to misunderstand him. Firstly, when we think of a waiter being fake, we usually think of them being overly polite (possibly for tips), or something like that. This makes it a terrible example for Sartre, because people already confuse his "in-authenticity" with the sort of "phoniness" that that annoying kid from Catcher in the Rye was always whining about. That isn't what Sartre means. He doesn't care about people consciously being "fake", what he is worried about is people who try to become things, or use their position in society as an excuse to deny their freedom. So it isn't that the waiter is being polite when he secretly wants to be a dickhead, it's that he is using the fact that he "is" a waiter to explain his actions, rather than admitting that the actions came solely from his own freedom. The other big problem with this example is that Sartre never really gives a clear account of how one is supposed to be a waiter totally authentically. This was a particularly thorny problem, because people accused Sartre of being classist. It seemed like maybe the only way to live authentically was to write philosophy books in cafes drink wine with your writer friends. While Sartre was a communist, he had a very contentious relationship with the Communist Party. They had often accused his existentialism of being a kind of bourgeois luxury for people who have enough free time to sit around think about their existence, and that it was not a philosophy for the proletariat, who were much more concerned with their material conditions. Sartre, of course, denied this, and claimed that it was a philosophy for everyone. With that in mind, maybe he shouldn't have used example of how people were totally in bad faith for trying to do their job. But, you know, whatever I guess.